This week we have found deals on everything from the latest books and DVDs to fun stuff for the kids. So why not take a look and see what catches your eye? Who doesn't love a good deal? Why not grab a bargain this weekend with some of these hard-to-beat special offers? Just bear in mind that all offers are subject to each store's own terms and conditions - and could be changed or removed at the retailer's discretion. All the deals featured were accurate on 17/10/2012 and based on online prices - so prices in store could be different. 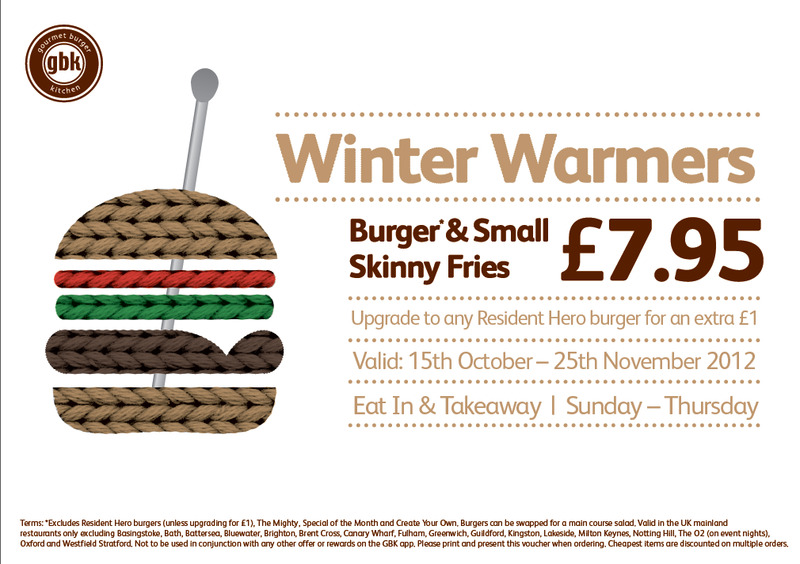 Why not ditch the diet for the weekend and treat yourself to a burger and small skinny fries at Gourmet Burger Kitchen for only £7.95? This voucher can only be used Sunday-Thursday and expires 25th November. If you're passing by a Yates's this weekend, you could get a 'free' scampi & chips when you buy a drink. All you need to do is sign up to their website to be e-mailed a voucher, which can be used up until 1st November. This voucher can get you a 2 for 1 offer on hot main courses at selected Roadchefs (valid until 31st December). And if you regularly travel by train, you could get 20% off at UK railway station brands including Burger King, The Pasty Shop and Millie's Cookies with a Bite card. If you're a fan of period dramas, you've no doubt been watching the latest series of ITV's 'Downtown Abbey'. If you missed the first two series, or you simply want to revisit them, Amazon.co.uk has the series 1 & 2 boxset for the bargain price of £14.75. All you bookworms out there will probably be itching to get hold of the recent Man Booker Prize winner 'Bring up the Bodies', by Hilary Mantel. Amazon.co.uk has the winning novel for just £8.86 (RRP: £20). Or, if BBC's 'Great British Bake Off' final has inspired you to get into the kitchen and make your own show-stopping cakes, breads and pastries, Amazon.co.uk also has Paul Hollywood's book, 'How to Bake', for £8.86. If your offspring are big followers of football, ASDA has the ideal gift for any young Arsenal fan (16 years old or younger): a tour of the team's Emirates Stadium for just £6! For your kids who love a good story, ASDA also has a range of personalised storybooks for young children - including titles featuring Mickey Mouse, Dora the Explorer and Finding Nemo - that start from just £9.50. JDSports.co.uk has some great discounts on junior clothing and accessories, including £12 off a London 2012 Mascot Backpack (now just £3) and K-Swiss Arvee trainers reduced from £35 to £20. The Co-op have a half-price offer on selected bottles of Two Ravens wine - was £8.99 per bottle, down to £4.49 (just remember to enjoy responsibly). While you're there, you could also take advantage of some great 'buy one get one free' offers, including treat-size Cadbury's chocolate (£2.59 each, until 6th November) and Quaker Oat So Simple porridge (£2.29 per pack, until 30th October).